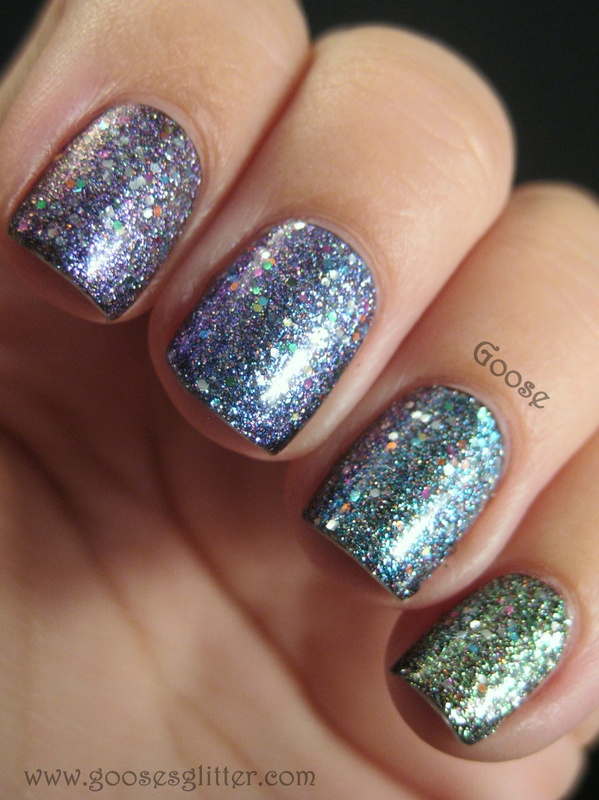 This is my FAVORITE way to wear the China Glaze Prismatic Chroma Glitters: as skittles over a black base. While they're also gorgeous on their own, I love how the black really brings out the colors in the duochrome glitter base on each of these. The next three pictures I took in my new tabletop studio light box with artificial lights. I'd like to know your opinion on which pictures you like better. I know I don't want to rely on the sun anymore (I like swatching at night! ), but now it's a question of whether I should get a couple daylight lamps to use for my pictures. What do you think? Part of why I wanted to revert to artificial lighting is so that I can set up the lights in a position that will show the duochrome nature in some of my favorite polishes (including these). I thought the next two pics showed the multiple colors a little better than my natural light pics. So what do you think of my new photography setup? Do you like how the pictures look overall? Or how they catch the duochrome a little better? Let me know what you think because I'm still deciding on some daylight lamps! I haven't yet seen the China Glaze Prismatic Chroma Glitters yet in stores. I was frantically searching for them and found my set on Phoenix Beauty Lounge. They are based in Canada but shipping was reasonable and super fast! When I ordered, one of them showed out of stock, but a few hours later they emailed me to say they did have it and asked if I'd like to add it to my order before it shipped out! Seriously, GREAT customer service! They are also available on Transdesign, and Wet n Wild has come out with a Coloricon set that are dupes to these. Love this! I think that the best way to wear these is over black. I really like the lighting situation you have going on here, it really captures the slight duochrome and the multi-colored glitter nicely! Thank you for putting them all next to each other! it's so hard to tell which is what and compare them when they're separated..
Layering the chromatic glitters over black is such a good idea, I shall try it sometime too! I like to paint my nails at night too, less chance of messing it up. And your new photography set-up is very nice, great pics!! Wow these look fantastic over black! These are the first swatches I've seen of these that have made me say WOW! The lighting you have going on is fantastic! OMG! Looking at me you'd think I won the lotto the way I was smiling at your blog like a crazy-person all happy at your two-days-in-a-row-post! I've missed you! And this post is brilliant! 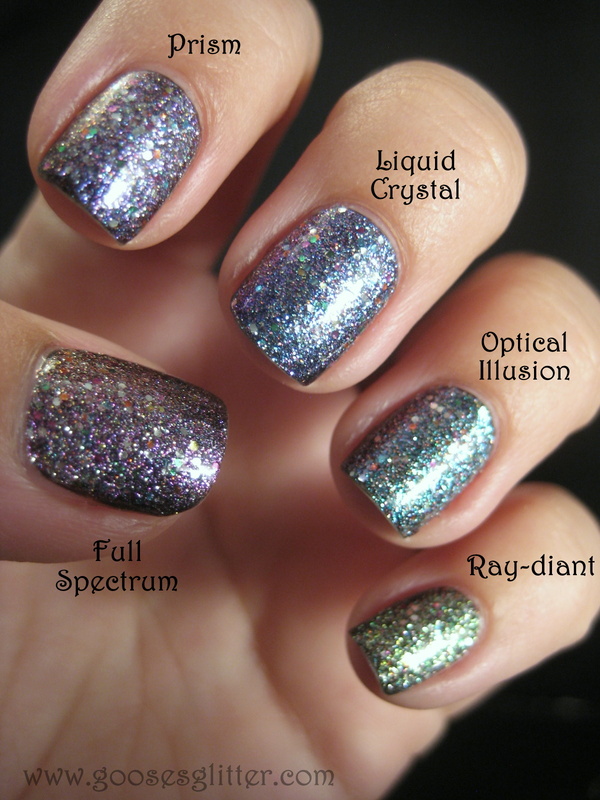 I love all the glitters -- I think Ray-diant is my favorite, well, then again, so is "Prism" - and "Optical Illusion" -- and crap, they all look fabulous! Do you have a favorite? I wonder how "Ray-diant" would look over "Peridot" - then again, "Peridot" is too pretty to cover! I completely agree with you, better over a black base. Also, not for nothing, but let's face it, how many people really admire e/o nails out in the sunlight? Not many -- most of us folks admire e/o polish indoors under (usually) fluorescent lighting, so I actually think your indoor/artificial light/night shots are pretty freaking fantastic! Man, I am SOOOO happy with this post (or rather, the-two-days-in-a-row-post) ;) -- I tell ya, your not posting for a bit last week really threw a wrench into my life! Your blog = my visual crack. :) Thanks for the awesome post! I did one kinda thick coat of China Glaze Liquid Leather (it's a jelly, so it was a little patchy, but doesn't show when you put the glitter on top), and waited for that to dry (and took the dogs out, haha). Then I did the thinnest coat possible while still making sure it was smooth and even of each of the Prisms. Then I topped 'em all off with Gelous and Seche Vite and they were, for the most part, very smooth. I really like this - the way you have done it. 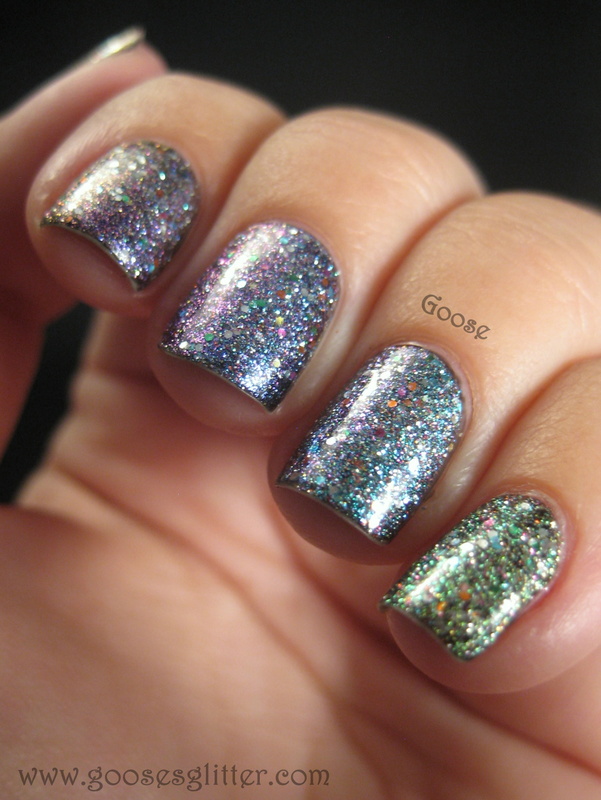 I will probably pick up one of these, but I just can't justify any more glitters in my collection. I will be passing on the WnW dupes - I just don't like their formula or brushes. 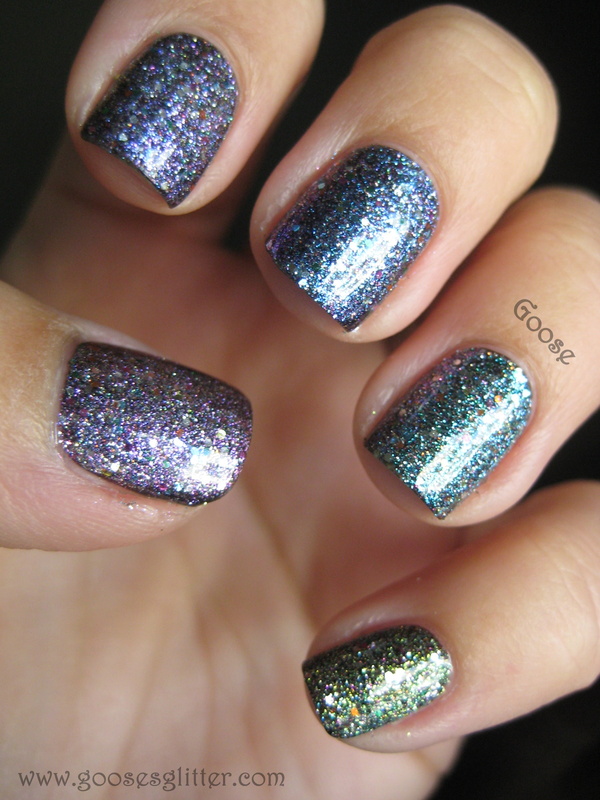 These are so so pretty, I think I like Prism the best. I really like how you layered them over black. I'll definitely be making a trip to Ulta when these come out! These look amazing over black! I don't think I'd seen anybody do that yet? I'm not sure, my brain is dead. Anyways, they look fab and I really like the lighting. Totally captures the different dimensions of the polish. This is one of my favorite collections of China Glaze, I just love them so much! Your pictures make me want to go take off what's on my nails (Nicole by OPI- Kendall on the Katwalk) and go put on Optical Illusion, it's so beautiful!